Kuch The Mooch: "Does This Constitute A Story?" That’s the question GolfDigest.com’s Joel Beall asks and does a nice job answering after a fellow golf pro called out what he saw as Matt Kuchar’s substandard pay to a caddie last fall. Now, while the list of athletes indiscretions is long, being tightfisted spurs a special kind of fury. Ours is a culture that implores the rich to spread the love; those failing are branded. Michael Jordan, Scottie (“No Tippin”) Pippen, Pete Sampras and, yes, Tiger Woods are some of the alleged stars with alligator arms. The irony in this escapade like other recent episodes cited by Beall: this was started and fueled by one of Kuchar’s peers, not a media outlet. As players have increasingly shunned media for social media to break news or tell their story, it’s fascinating how many examples we’ve already seen of players calling out fellow players on social media in ways more harsh and reputation-damaging than a traditional media outlet would dare. After all, few in the golf press dared to touch the story until Kuchar had a chance to play his round, collect his thoughts and chat with press. Some of his peers were judging before he’d had a chance to comment. 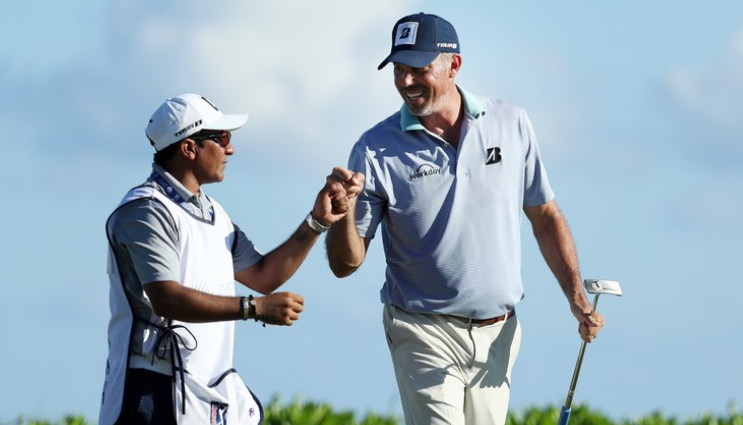 It’s a phenomenon worth nothing as players increasing view traditional journalism as “out to get them” even as, at least in Kuchar’s case, the damage was done before he even reached the media center. As the European Tour continues to set the bar with fun, inventive and clever social media stunts, the PGA Tour offered another under par counter for Brooks Koepka’s 2018 Player of the Year rollout. Mercifully, he was spared having to pose with Like-inducing animals, as far as we know. 🏆 @BKoepka accepted his Player of the Year Award today. Maybe this is why Brooks didn’t bother to vote, as reported by Will Gray at GolfChannel.com. 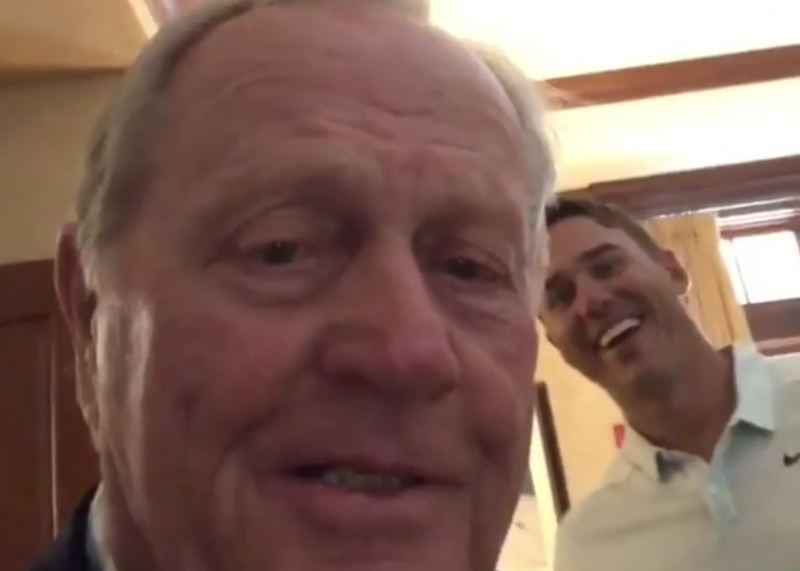 The trainwreck continued with not one, but two photobomb videos involving Jack Nicklaus and Koepka. Note to the legion of VP’s: one photobomb a day with the same two people is the max. Two means at least one is not technically a photobomb. Have your kids explain if this is too confusing. After mostly automated social posts, Justine Reed—she can’t confirm or deny—took to social media to defend her man after husband Patrick struggled in foursomes and four-ball play at the 2018 Ryder Cup. G.C. 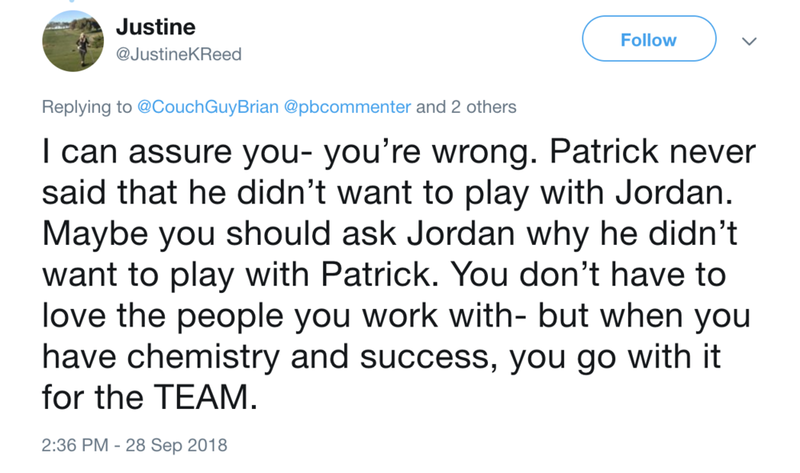 Digital with the details of Reed’s defense of her husband’s play and suggestion that Jordan Spieth be asked why the vaunted Spieth-Reed partnership has ended. Golf.com’s Dylan Dethier got a strange non-denial denial from Mrs. Reed regarding the legitimacy of the account and Tweets. I can't put a finger on what might have gone wrong for Lee McCoy--wait I can, he has proven to not know what he doesn't know and is a defender of backstopping. The Bobby Jones Award is not in his immediate future. Seems the Web.com Tour player took to Twitter to complain about South American children wanting some more than a free autograph for coming out to watch the developmental tour play in their country and also insulted the country. As Joel Beall reports for GolfDigest.com, the offending McCoy Tweets now sleep with the fishes and McCoy has taken the Grayson Murray path of suspending his account. And we know that how well that turned out for Murray. McCoy tells Beall he has learned his lesson. "To say I learned a valuable lesson would be an understatement," McCoy said. "More importantly I want people to know that I am, and always have been, a strong supporter of growing the game and doing everything I can to give back to the community." There is nothing quite like a Pro Golfer Twitter spat and today's Brandel Chamblee v. Jason Dufner back-and-forth resulted in a conclusion just about everyone saw coming: Chamblee blocking the 2013 PGA Champion. Alex Myers of GolfDigest.com explains what precipitated the manspat--a jab at Dufner instructor Chuck Cook at a seminar, followed by a side Twitter conversation where Chamblee was included against his will. Unable to get Dufner and friend to not include him, Chamblee reached for the block button. Now, let's revel in the immediate apology from HOF Point Misser and undoubtedly-freshly-fined PGA Tour player Grayson Murray first, then quibble later. Regarding my tweet the other day. I want to apologize to the tour and the guys on the Champions Tour. I have nothing but respect for the guys that paved my way to play this game. I'm sorry to everyone I disrespected and I take full responsibility for my actions. For those unaware or simply distracted by things that actually matter, Grayson Murray comes from a world where those who make money are good and those who cause the PGA Tour's stil-robust bottom line to show a few red numbers, apparently are not so good. That was the basis for his post-Schwab Cup controversy thoughts, since deleted. He was scolded by, among others, Curtis Strange, who has won more U.S. Opens that the rounds Mr. Murray has played in the U.S. Open. Given that Mr. Murray also failed to break 80 in either of those rounds, it's clearly he saw some sort of light from Strange's rebuttal Tweet that cited the way-pavers. However, I must quibble that the current players on the PGA Tour Champions paved a way for Mr. Murray to ply his trade. That honor would actually go to Willie Park Sr./Jr., Allan Robertson and Old Tom/Young Tom Morris, folks I'm willing to bet he's never heard about. Their fine efforts for professionals were continued, with major injections of freshened paving from Harry Vardon, Ted Ray, J.H. Taylor, Walter Hagen, Gene Sarazen, Ben Hogan, Byron Nelson, Sam Snead, Arnold Palmer, Jack Nicklaus, and should Mr. Murray leave these United States, the likes of Gary Player, Peter Thomson and Seve Ballesteros, among others. Today's PGA Tour Champions are riding the remnants of a wave initially fueled by some of the aforementioned. They still warrant respect for having devoted their lives to professional golf and doing their best to create a place for the likes of Grayson Murray to make a living, and presumably play a sport he loves, after he turns 50. God helps us all should he ever think of himself as a path-paver. The Grayson Murray World Twitter Tour started again November 2nd after a self-imposed hiatus and the legendary PGA Tour buffoon has already had to hit the delete button (and no doubt the Pay Fines Here button in the coming days). Golf Wire reported for Golf.com on Murray's reply to Tweets about the bizarre Schwab Cup ending that cost Bernhard Langer the season-long points race. In response to a tweet detailing Bernhard Langer's accomplishments on the senior circuit this season, Murray replied: "Does anyone really care is the real question...These guys were relevant 10 plus years ago." In another reply, he conceded that the pros on the Champions tour had "laid a good foundation" for the next generation, but then added: "You will never see Phil, Tiger, Furyk ever play on it! The tour subsidizes it every year. Loses a lot of money." Meanwhile over in Europe, former player and longtime commentator Gary Evans has retired from Twitter following a dust-up with the increasingly profane Eddie Pepperell. Martin Inglis summarizes at Bunkered and I'll let you read the Tweets there as Pepperell likes to, uh, pepper his social media missives with colorful langauge! The joys of a good Saturday morning Twitter spat to keep us entertained until the leaders tee off many hours from now. Must Read: "Threat of stalkers, trolls makes social media complicated for LPGA players"
Beth Ann Nichols files a Golfweek.com eye-opener on the social media ramifications for LPGA Tour players. From the security issues to sponsorship opportunities won and lost, it's a fascinating look into the risks players take in sharing more about their lives. Just one of the many revealing bits from LPGA Tour Security Director Joe Funk, who says he spends about 60 percent of his time tackling social media related issues for players. Funk also warns against players posting too much private information about their schedules. Geotags, for example, make public the real-time GPS location of a player’s whereabouts. Though in the case of four-time winner Wie, something as innocuous as a Tweet about a sunrise practice session at the LPGA stop in Portland, Ore., a few years back turned alarmingly bizarre. It didn’t take long for security to notice the man in the powder blue suit and floppy hat at 6 a.m. Turns out he took a bus from Iowa to Portland to propose to Wie. “We took him to the hotel and put him on a bus back to Iowa,” Funk said. The man showed up once more in Rochester, N.Y., but hasn’t been heard from since. I've seen some interesting uses of Twitter and while this one borders on extortion and surely kept the Fines Department working overtime, few will have sympathy for Ben Crane given his consistent refusal to become a faster player. Or apparently, to pay off a bet. 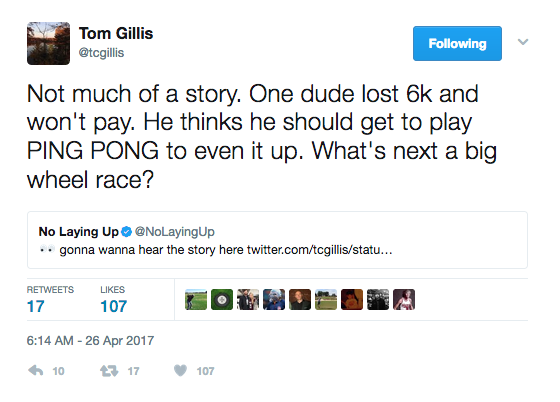 Regarded as the slowest player by his peers for well over a decade now, Crane was called out by fellow PGA Tour player Tom Gillis for not paying off a bet with an unnamed friend of Gillis. He also threw in a reference to Crane's Minister for good measure. Gillis went on to respond to many and clarified money was not owed him. 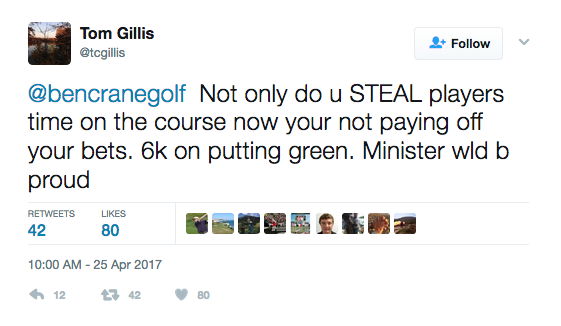 Golfweek's Kevin Casey has a roundup of the Gillis Tweets, including a suggestion that Crane is now planning to pay up, and a follow up Instagram post from Charley Hoffman, who is calling out Crane as well. Of course, few sympathize with Crane, who disrupts the rhythm of his playing partners with his pacing and makes watching the PGA Tour "product" insufferable when he's standing before you. But he has been enabled his entire career by Tim Finchem's desire to not see players publicly penalized or recognized for their rude ways. Sad it comes to this kind of petty social media bickering but...he earned it. Golf has been very fortunate to have players use social media largely for the purposes of highlighting sponsorships, thanking tournaments and sharing little glimpses into the life of a tour pro. The LPGA's players were ahead of the curve and remain so, while PGA Tour players have caught up in some regards. So while I saw some of the chatter on my feed, it wasn't until G.C. Digital put together the musings of Grayson Murray, world no. 155, that I realized we have our first Grade A, All-Conference PGA Tour Social Media Point Misser. Though Murray's vowed to take a leave from Twitter following the hate he received for questioning the world ranking standing of foreign players--even when one made the semi-finals of the WGC Dell Match Play--Murray inexplicably crossed a line I never thought I'd see a player cross: his idea of a jab back at Ben An was to question the path he took to the tour, even though An is exactly 100 places higher on the world ranking list and certainly far more accomplished as the youngest U.S. Amateur winner...ever. Here is the full list of offending Tweets, which ends with a profession of love for the President. I'm not a fan of the PGA Tour fining players for merely being ignorant, nor do I support the secrecy of fines. However, Murray's disrespect for his peers and general need for attention certainly warrants a deduction from his PGA Tour account, or however that works. Though given his missed cut streak, there may not be sufficient funds. At least he opened with a nice round in Houston! They last manspatted almost a year ago over the purpose of Rory's conditioning work and given the recent injury news, it's a tad surprising McIlroy is pushing back at Chamblee's assertion that the best players hit down on the ball. Maybe Chamblee's Twitter reminder upon this week's injury news started the latest squabble? Anyway, McIlroy counters that they hit up on the ball and given what Trackman tells us, and the way Rory drives the ball, his pushback Tweets made sense. Of course, this is reminscent of the days when Jack Nicklaus used to feud with Jim Flick over backswing footwork, or when Lee Trevino once nearly came to blows with Harvey Penick over the true meaning of Take Dead Aim. Just kidding! For The Win's Luke Kerr-Dineen on the latest flare up. Bloomberg's Scott Soshnick with details of a new PGA Tour-Twitter broadcast partnership that covers 31 events and 70 hours over the course of the season. Essentially they will provide 60 or 90 minute pre-game show coverage before PGA Tour Live and Golf Channel's weekday coverage commences. PGA Tour Live has been providing coverage in the pre-Golf Channel window and will continue to be there for its subscriber(s). Theoretically this deal will encourage more to sign up for the paid PGA Tour Live service and gives the Tour more of the digital presence new Commissioner Jay Monahan telegraphed in this Q&A. There is also the big-picture effort to create new distribution channels for eventual Golf Channel negotations when that deal expires in 2021. **The details suggest this is more of an effort to prop up PGA Tour Live than first realized, and even lighter on actual live golf coverage than first thought. The Twitter coverage will be initial window of PGA Tour Live coverage ($39.99 annually). Once the tour moves to the central and eastern time zones, this will be virtual middle-of-the-night coverage for west coasters. Twitter will begin live streaming at the CareerBuilder Challenge on January 19 and conclude at the season-ending TOUR Championship. Coverage typically will include the first 60 to 90 minutes from the early Thursday and Friday morning hours of PGA TOUR LIVE’s Over-The-Top (OTT) subscription window, on a global basis. This coverage will include pre-game analysis, interviews, range coverage, and live competition from the first two holes of each day’s PGA TOUR LIVE Marquee Groups. The first two holes. Woohoo! The live streams will be available globally to Twitter’s logged-in and logged-out audience on Twitter and connected devices and can be found at PGATourLive.twitter.com and on @PGATOUR. The partnership also includes opportunities for advertisers, including packages with television style mid-roll spots, combined with original clips produced by the PGA TOUR, available for sponsorship and promotion on Twitter. Again, the fantasy of ownership and revenue sharing seems to be the PGA Tour dream, instead of merely letting people write you checks. The partnership also includes an extension of the PGA TOUR and Twitter’s Amplify program, with PGA TOUR increasing its highlight videos and regular content creation across Twitter and Periscope. Finally something that sounds smart! Darren Rovell with one of the more amazing point-missing exercises in the social media area, as the United States Olympic Committee has notified companies who are not official sponsors that they must pretend the Games are not happening. In a letter send to sponsors of athletes, Rovell says the USOC warns of stealing intellectual property. "Commercial entities may not post about the Trials or Games on their corporate social media accounts," reads the letter written by USOC chief marketing officer Lisa Baird. "This restriction includes the use of USOC's trademarks in hashtags such as #Rio2016 or #TeamUSA." The letter further stipulates that a company whose primary mission is not media-related cannot reference any Olympic results, cannot share or repost anything from the official Olympic account and cannot use any pictures taken at the Olympics. Social media is largely a reminder and branding service that merely threatens to remind people to watch or enjoy the exploits of an athlete. While you can understand their need to protect the Team USA sponsors, it's got to be tempting for some to test the bounds of this to see just how far the USOC will go to "protect" its turf. They've Arrived! The Masters Is (Finally) All In On Social Media! This is exciting for a few reasons. The paltry-for-a-beloved-tournament numbers speak to the previously guarded approach to social media: 408,000 Twitter followers and 125,000 Instagram followers. A) The Masters folks have already Tweeted and Instagrammed more content the last few days than they have in all the previous years combined. They've even posted photos of players playing weekend practice and of the club scene the Saturday before all the fun begins. B) This could, I repeat, could mean that we are moving to a day when fans wanting to watch great shots and moments in Masters history do not have to view them through some guys' video of his TV set. So far, no Masters YouTube account, but we'll take the baby steps. And even a Masters merchandise post, with hashtag! And it consists of probably never going to his various feeds after a 76.